Collectible spun glass figurines are delicate little treasures that are created from hot molten glass. Often called lace glass, or lace crystal figurines, spun glass pieces are often intricate and elegant works that are prized by collectors all over the world. Generally made from fine crystal, spun glass figurines are an exquisite site to behold. Although spun glass figurines are usually clear in color, they often have details of different colored glass accents. Excellent examples of this are the spun glass train through The Orient Express and Chopper Motorcycle which both feature beautiful gold colored trim. There are many ways to beautifully display a spun glass figurine, or a figurine collection. Collectors often place a small oval or round mirror under the figurine to highlight the elegance of the intricate glass. A light source, such as sunlight streaming through a window, adds to the beauty of a spun glass piece as the sunlight highlights and reflects in the glass adding to its sparkle. A large spun glass figurine such as a sailing ship makes a spectacular centerpiece on a table or coffee table. If you have a fireplace, the effect of the flickering flames on the ship will be stunning as the spun glass shimmers in the firelight. 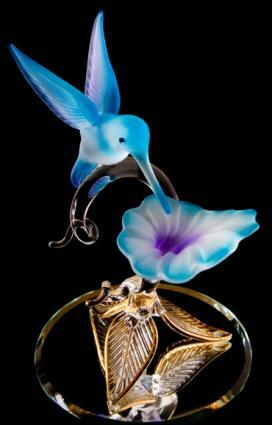 Small spun glass figurines, such as animals or fairies, look beautiful when they are displayed in a lighted curio cabinet. Some collectors prefer to arrange their figurines in groups to display them, while others enjoy featuring a special figurine by displaying it alone. Spun glass figurines are extremely delicate and break very easily. Because they are very appealing to both adults and children, people often want to examine the figurines more closely to find out how they are made. Since they are extremely fragile, it is best to keep them in a place where they will not be handled very much. Many collectors like to keep their spun glass figurines in enclosed curio cabinets or display cases. Lightly dusting your spun glass figurines on a regular basis will keep the sparkle in your special treasures for years to come. If you should find that a spun glass piece needs deeper cleaning, it should never be placed into a dishwasher. Place a soft towel into a sink or dishpan and fill it with warm water. Add a few drops of mild dish soap and carefully place the spun glass figurine into the water. Allow it to soak for a few minutes and then rinse the figurine with warm running water. If it still needs further cleaning, gently wipe the figurine with a soft cloth. Antique Collectibles Collectible] spun glass figurines are not only beautiful to own, they also make wonderful gifts for people of all ages.